In our worldwide test centers and laboratories (in Germany, USA and The Netherlands) we have at our disposal a large number of test systems. Our highly experienced process engineers for the areas of process technology and process engineering are in a position to conduct and simulate fundamental tests using the latest tools. Cash in on this experience and the test data accumulated over the last 50 years. Through the data which have been determined and evaluated you can select through us the machinery best suited to your requirements. Here we focus especially on an integrated approach for the process and the system. After having commissioned your machine our engineers will support you in the optimization of the process engineering processes. Our Heinkel Group USA Test Center in Swedesboro (New Jersey) is able to perform both Filtration & Drying testing of your products. Evaluation of products at the Test Center is a useful tool when searching for solutions to your filtration or drying process. In addition to the equipment testing, the Heinkel Group Test Center also performs Computer Modeling which can be used before, during or after equipment testing to provide additional data and optimization of the test work. After the trials are completed, a full report is then prepared describing in detail the findings of the testing evaluation. 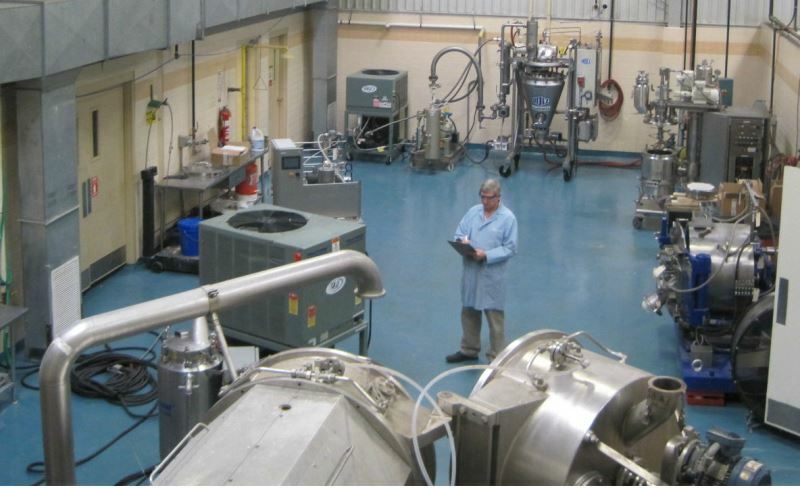 Our Process & Application Engineers working together with the customer can then determine the correct machine and process parameters to achieve optimal filtration or drying results on centrifuge and drying equipment. Existing customers are able to utilize the Test Center in a way that can help optimize a process that is already currently running on a HEINKEL centrifuge or dryer equipment. Heinkel Group's engineers can simulate and/or troubleshoot a process in our laboratory to minimize larger scale tests and the associated plant costs.